The following is a paraphrased and nearly completely inaccurate account of a recent text conversation. Text from Nan: J’s sick, can’t use tix to tonight’s show at Club Passim. Can you use them? Text from Dainty: Uh … wha? Tonite? Sure! Who’s playing, where’s it? Nan: Meg Hutchison. She’s great. H Sq. Dainty: We’re in! Coming after Baptiste yoga, could eat a cow. Do they have food? Nan: Veggie Planet serves their food. Order Henry’s Dinner. On a pizza. Trust me. Jennifer and I do indeed trust Nan—she’s a lawyer, after all, and we love her. We go to Club Passim, ravenous, and after a cursory glance at the menu, immediately ordered the Henry’s Dinner, pizza version. Something about sweet potato, goat cheese, asiago, rosemary and sage—oh, don’t forget the caramelized onions—all atop a whole wheat pizza. First thought: Um … yeah. It’s really good. Things that should come together as a side dish at Turkey Time turns out to be a great topping for a pizza. Second thought: I could totally make that. And I did Here’s my version. -We had a gigantic sweet potato, so we spiked it with a few holes and popped it into a 425F oven for nearly an hour. After 45 min you want to keep poking a fork in it to see if it’s done all the way through. When done, let it cool enough to handle. The skin will just peel right off with your hands. Slice it into 1/4-1/2 inch think rounds. -While the potato is cooking, slice up that sweet onion. Add about 2 tbs olive oil to your trusty large skillet, set on medium high, and toss the onion in there. Add maybe 2 tbs balsamic vinegar. Sprinkle generously with kosher salt. Toss often. After a bit you’ll want to turn the heat down low and let it saute low and slow. Half hour, maybe. Give the onions a taste halfway through – you might want to add more balsamic to your liking. When they’re done, let them cool, too. -Heat the oven to 480F. Got a pizza stone? You need one, seriously. -When you’re ready, flour your counter and roll out that pizza dough – thin but not super super thin. Sprinkle a pizza peel with fine corn meal and lay that dough on there. -Next, brush the dough surface with some olive oil. Now you can arrange your ingredients however you want. I put the caramelized onions on the bottom. 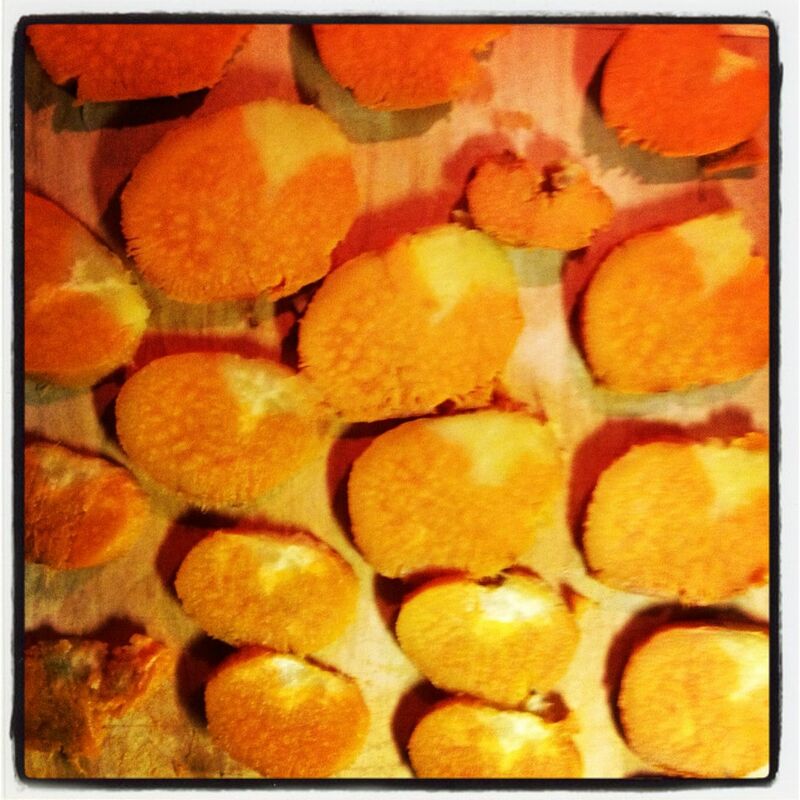 Next I layer with sweet potato – I broke my potato slices into chunks and spread them out a bit. Same with the goat cheese – I just broke chunks off the log and applied liberally. Next, a generous dusting of the rosemary-sage mixture, followed by Parmesan cheese. Salt and pepper on top. -Slide the pizza onto the stone. 6-7 minutes is all you need. You should have enough ingredients for two pizzas, so while the first one is cooking, get the second one all set to go. -Wait 3 minutes before cutting into it. You gotta let that thing set up. Jennifer just took the leftovers for lunch and popped it into the break room toaster oven. A colleague asked, “Hey, is that the Henry’s Dinner pizza from Veggie Planet?” Looks like I got it right. 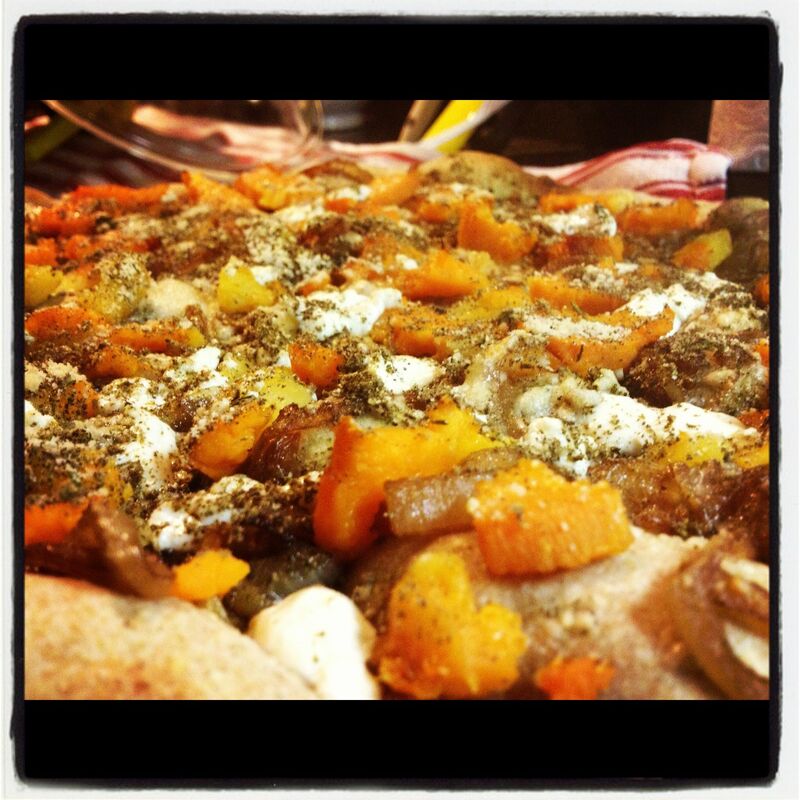 Goat cheese is fantastic on pizza, this is great recipes and I shall give it a try. « Update on Dainty: Where’d June Go? 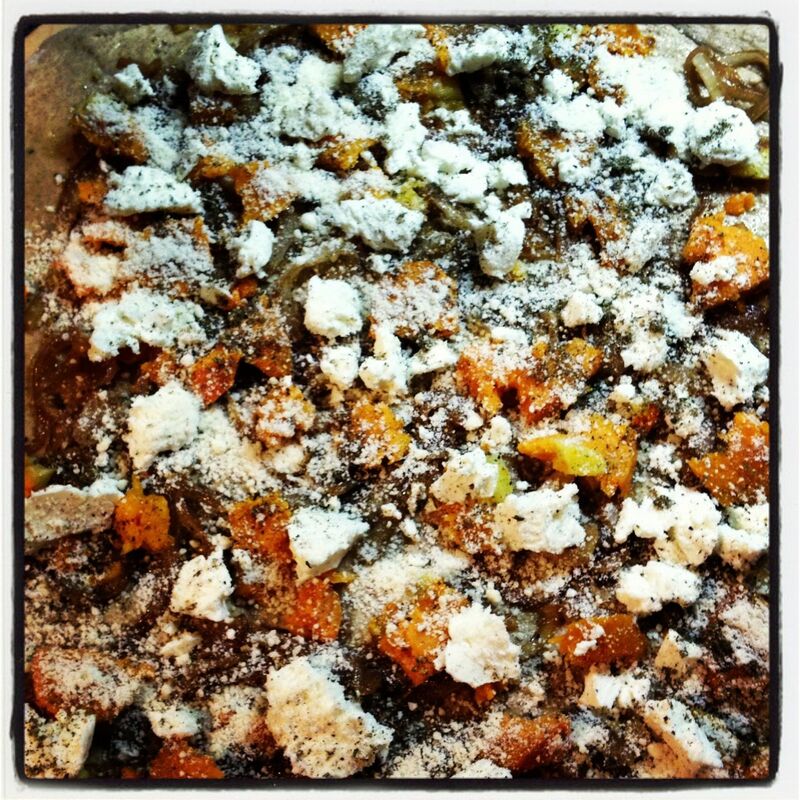 You are currently reading Sweet potato, goat cheese and rosemary-sage pizza at The Dainty Dot.